My Little Craft Things: Frilly and Funkie - What a Mesh! I hope you all had a wonderful Halloween this weekend! I curled up on the couch with my girls, set Nemo up beside me, poured a glass of wine and watched a horror movie. So, in other words, it was just an average day for me!! HAHA!! It's time for another challenge over at Frilly and Funkie. This time I am your hostess and I have chosen the theme "WHAT A MESH". I would like you to create a vintage or shabby chic project using any type of mesh (crinoline, cheesecloth, tulle, burlap, canvas etc). One lucky winner will receive a $25 gift certificate to Linda's shop The Funkie Junkie Boutique! Sending out a special thank you to my dear friend Anne of Redanne, who sent me the Prima mold I used to make this fabulous clock piece!! I am so pleased with look of it, I will definitely get great use of this thoughtful gift! Linda sells this mold in the shop, so I have included the link in the thumbnails. One of my favourite weather conditions is mist, the thicker the better I say! We don't get mist like this very often, so I was really excited to get this foggy shot of the lake. 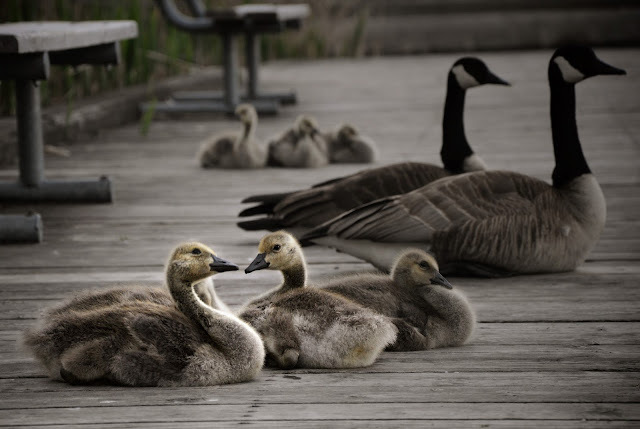 I waited for quite some time for that duck to pass by my camera viewer, but it was worth it! Also at the lake a while back, I grabbed this shot. They aren't babies any more now, so it's a lovely way to remember how cute they were! Out in The Shire, a couple of sweet girls enjoy their snacks in the lovely autumn sun. BON JOVI watches me very closely as I set up my blanket in preparation for a photo shoot. He has become quite the little Instagram celebrity as many of his photos have been featured in online galleries, and I was even interviewed for a Bon Jovi feature spot!! Handsome little devil is stealing hearts all over the place!! This is the first time I've ever been this close to a crow, they are loud loud loud!! Back on the home front, you will be glad to know that JUNIOR is still hanging around. He had to find a new home after they cut down so many of the trees beside the house, but he has found a great spot out back to hang out in!! MR SCRUFF is practising for his audition in the Cirque du Soleil!! HAHA! Last but not least, my macro for the day... 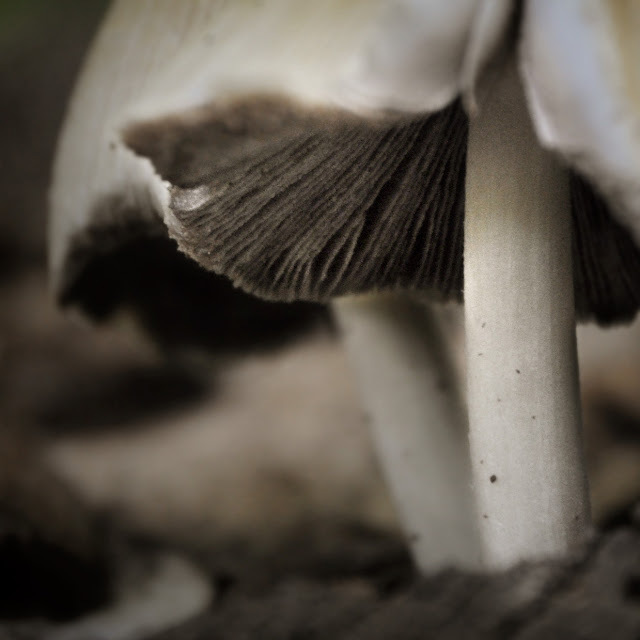 I didn't quite get the detail I wanted on these mushrooms, so I have upped my macro settings. This will make it more difficult to get a clear image, but when I do, the details will be worth it! Gorgeous festive card Pamellia..love the clock,the papers, and all the details and dimension..fabulous..love your photos today..the mist is quite chilling although beautiful and great to see Junior back.. 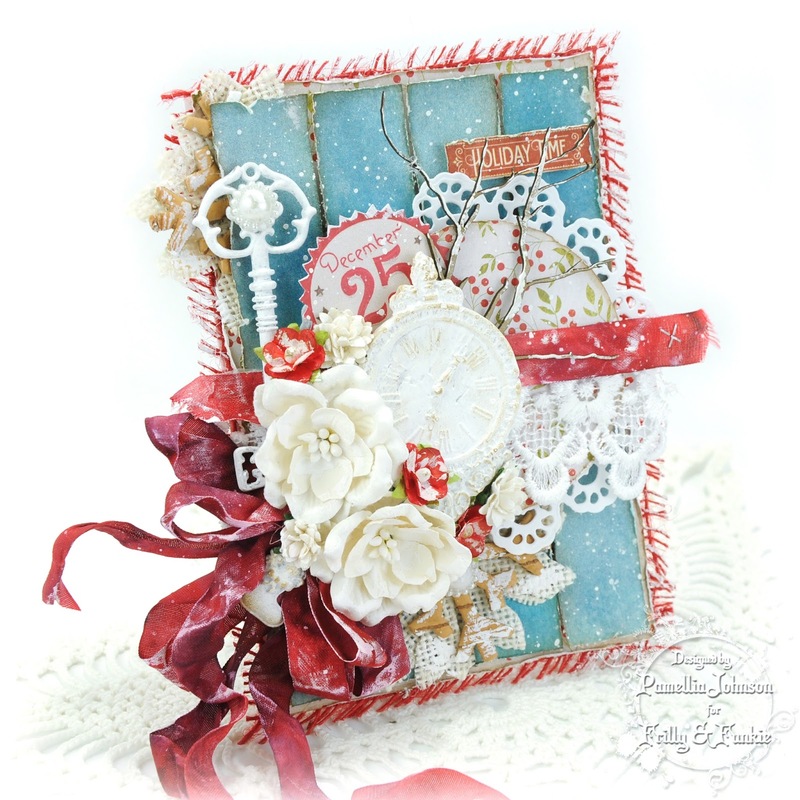 Stunning card Pamellia, beautiful colours and layers, the little clock embellishment is so pretty. What a wonderful card Pamellia - so very pretty and so much detail!! 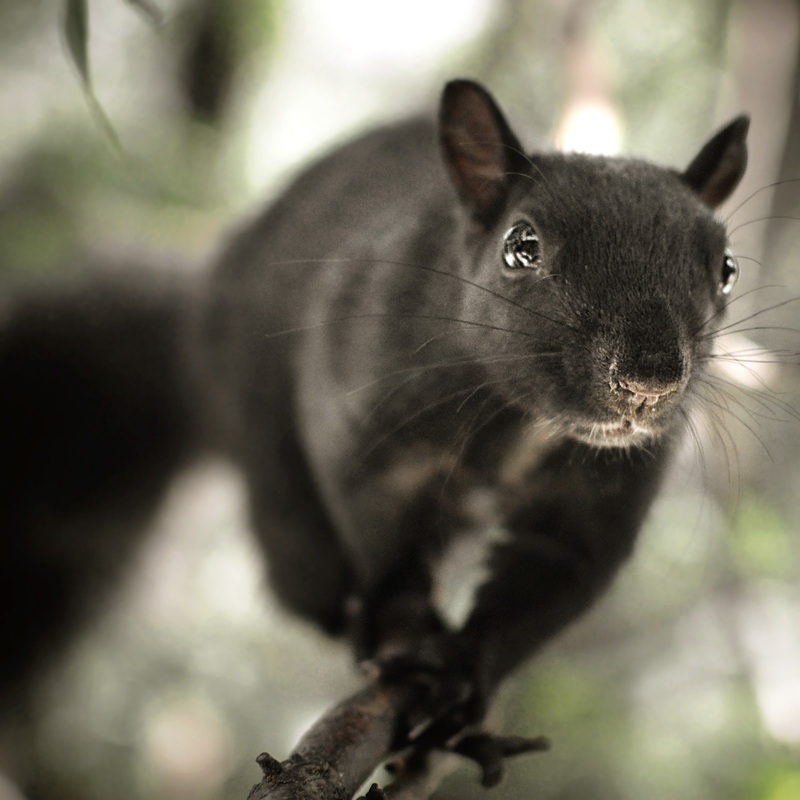 Love your animal shots, and Bon Jovi is gorgeous!! A very beautiful card and the cut out flowers are very inspiring--I could do that I thought. Love the photographs as always. We have lots of crows near to where we live and they even find something to eat on our front lawn--not sure what. They make such a noise and run around on the roof as well. Gorgeous colours on your make today, Pamellia! Oh my, what a gorgeous card, full of Christmas inspiration and I just adore the gorgeous red bow! 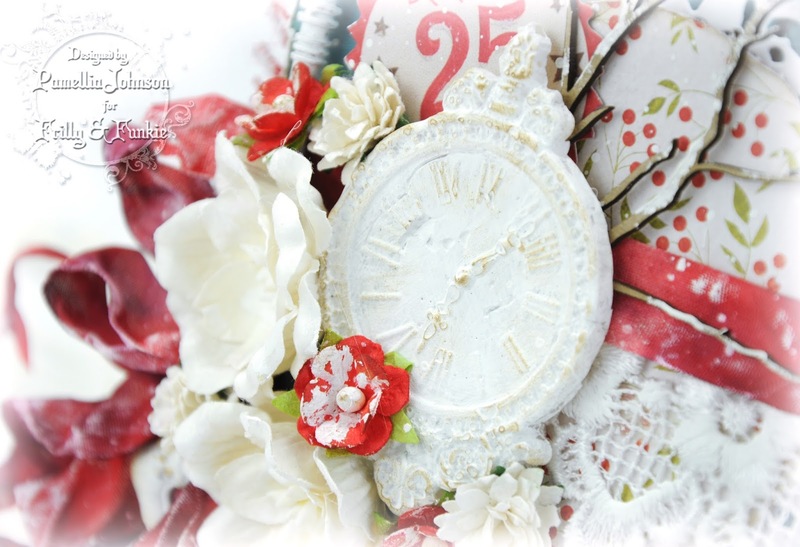 You are welcome, I am glad that you will get some use from the mold, the clock looks so pretty on your card. I just love dropping by here and seeing your wonderful photos ... they are my daily pleasure and seeing your stunning card is the icing on the cake! 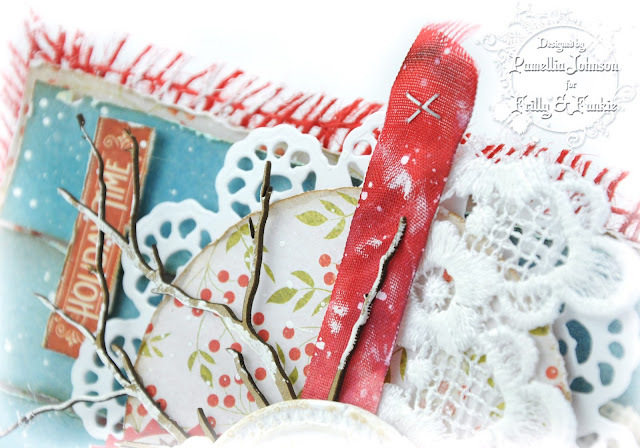 Beautiful, shabby card, Pamellia! Love your photos, particularly the foggy scene. I see Linda at the top of the page and was wondering what happened. Has that been up for awhile? 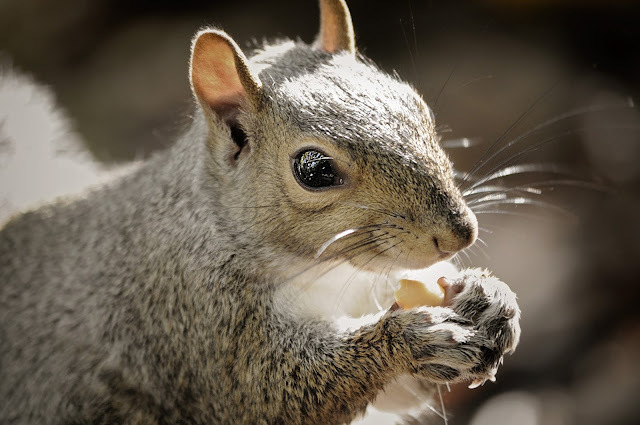 Linda had a large mass on her face last winter, but in the spring it drained and I thought she was recovering. I actually dedicated a canvas to her in April because I thought she was OK. Unfortunately, the relief for her was only temporary. Over the last couple of months she got worse and worse every day. She was in so much pain and she was starving to death. The wildlife centre did everything they could to ward off the infection, but the damage was just too much for her little body and we lost her just yesterday. Wonderful colourful card today, very festive! Beautifully designed and embellished as expected. 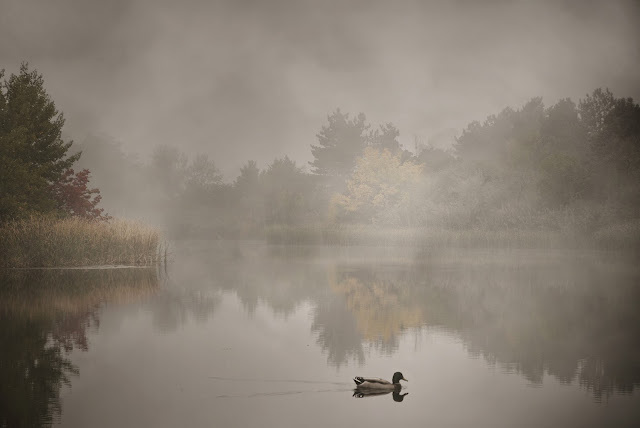 Super photos...love the foggy scene, you have such patience...waiting for the duck to appear...it was worth it! Whew - not quite ready for Holiday Time yet but... your card was a lovely way to get the "idea" planted in my head!!! Lovely unique colors and fun Pamellia. Oh dear - soooo soooo sorry about Linda. You did so much for her - extended her life for a bit by changing her diet - making her safe and happy. You were an awesome Mom. Your Mr. Scruff bi-line cracked me up and it does look just like that!! What a joy to see all your family happy and playful. And the foggy picture is truly beyond beautiful Pamellia. You are right - the duck was worth the wait - truly perfection. Wow. Xj. Your card is wonderful and your wildlife photos are exquisite. Love the way you altered the metals to white and that clock made from the mold is fantastic. And the red burlap peeking out from the edges is a total treat. Those molds have been calling my name for quite awhile now and I feel myself caving. Thank you for this lovely eye candy! Oh, such a fabulous colours combo!!! So fresh, sweet, lighty and festive!! Love it!! And your mold clock is a true delight! Love very much the key and the branches, too!! Fabulous details! That red frilly mesh all around looks great and matches so well with the crincled ribbon and the gorgous flowers! Beautiful all your shots! The foggy shot with the duck is just magical!! 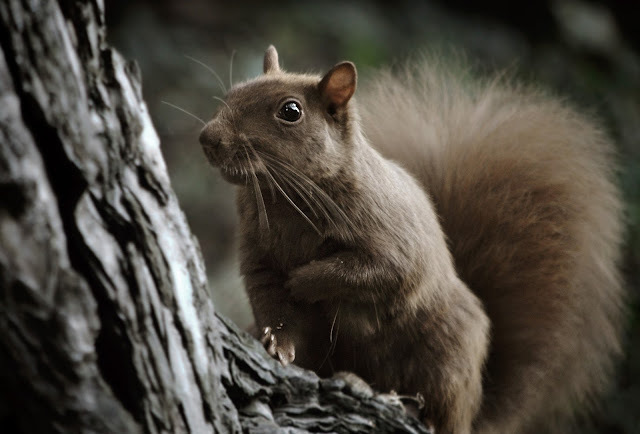 The squirrels are always so cute and such a fabulous tail has Bon Jovi!! Beautiful macro, too. these mushrooms haven't anymore secrets for you! First, I am so sad to hear about sweet Linda! I am so very sorry, my friend, for your loss! Linda were so lucky to meet you! She is certainly in a better place now with no pain and suffer! Your card is a feast for the eyes with such a beautiful color combo and incredibly beautiful layering, as always! That clock is really so pretty and I adore the way how you used the mesh here! Brilliantly done, my friend, as usual! 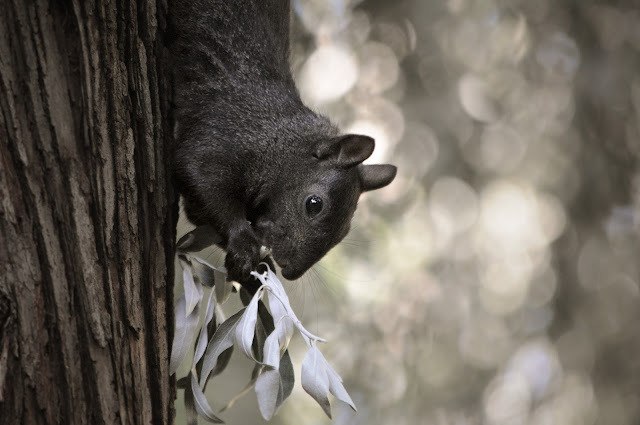 Thanks so much for your breathtakingly beautiful photos! The mist one is magical and you have captured the scene in such an amazing way! Love them all! 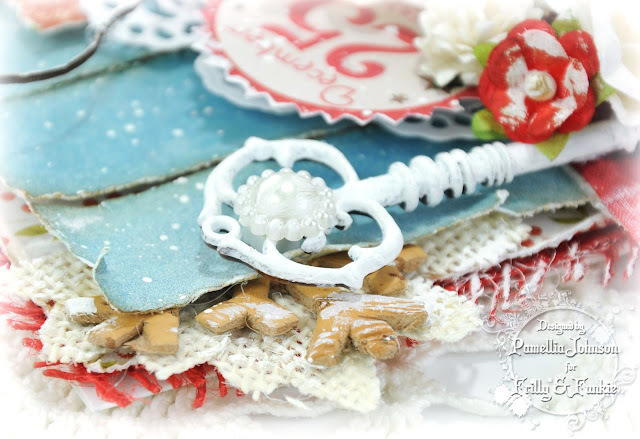 A beautiful card Pamellia, so many gorgeous details and I love the blue background. Wonderful photos and I noticed the picture of poor Linda, so sad. So sorry about Linda Pamellia, as you say she is out of pain now. Gorgeous card you have created, love the beautiful layers, pretty papers and fabulous embellishments. 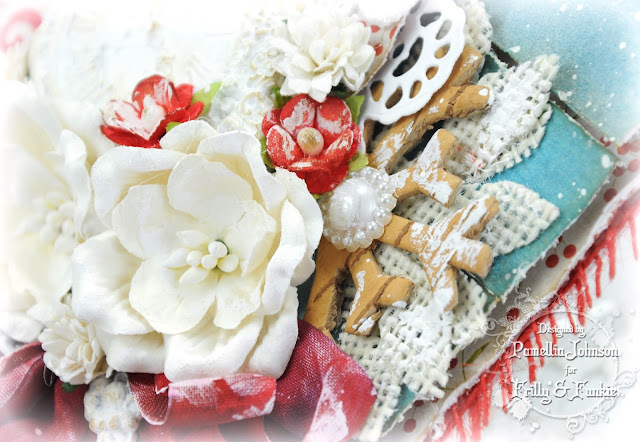 This is totally gorgeous and vintage and shabby-licious, Pamellia! I love the burlap flowers, the mesh edge and all the great embellies. The clock is fab! This card is anything but a MESH! LOL So good to have you back with us! You were missed! Oh gosh, first of all, Pamellia, I am writing this through tears. I am so, so sorry about Linda. I prayed that she would pull through but please take comfort in knowing she is no longer in pain. And know that you brought love and happiness to her last few days. Please excuse the lack of exclamation points in my comments...I absolutely love your project but I'm not in a very exclamation-ey place right now :( I know you are sad and hurting and I am hurting with you. Your card is over the top amazing. The layers, the colors the details...spectacular. I love the strips of blue background, the key, the clock, the flowers...every single thing. It is simply a work of art :) I can't wait to play along with this challenge. Its a gorgeous Christmas card, your attention to detail is always a delight to see. 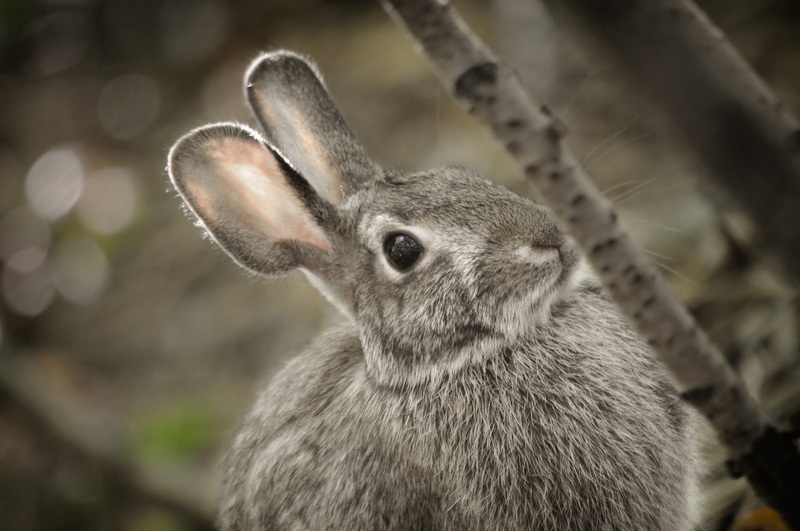 Wonderful photos, I especially liked the misty shots you took, the animals seem to like posing for the photo shoots and look so cute. Pamellia Im so sorry about sweet Linda! Its always heartbreaking to loose a little fur baby friend! She was blessed to have you care for her! Your card is beautiful, the aqua and red a delightful color combo and all the details make a luscious combo :) As always all you nature pics warm my heart!! 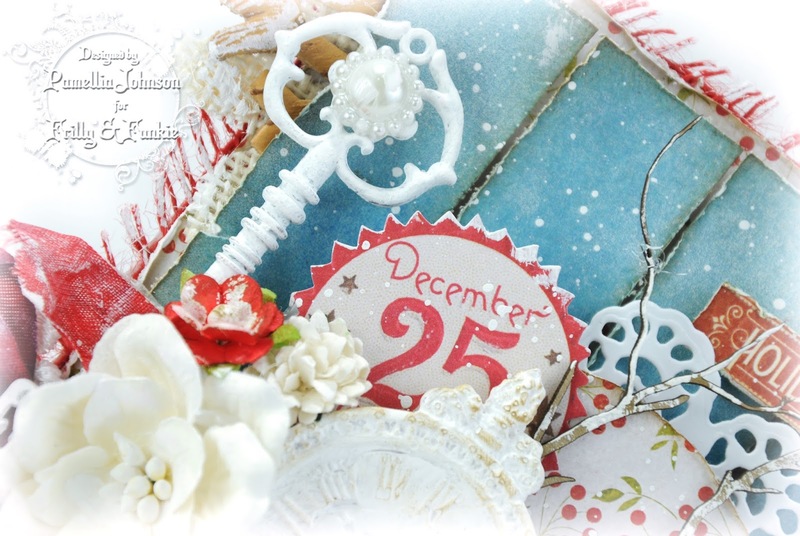 Fabulous Christmas card with many beautiful details! So feminine! And your photos, oh gosh, jaw-droppingly amazing! another of your superb creations, and such a very pretty design. That clock made with that mould is awesome and wonderful. Love everything you have used to create this super creation. Sending big hugs to try and help. Wonderful photos as always, and you sure do capture such wonderful ones. Beautifully put together Pamellia, I adore those festive colours, that particular shade of red is jus so perfect!! Amazing amospheric photos too!! Pamellia, I am full of sorrow over the passing of Linda. I am grateful she had you to watch over her, to try to nurse her back to health, and take her to the wildlife center in the end. And that she is no longer starving and in pain. So sorry for you, sweetie. I hope a hug will help ease the pain. Your card is lovely; gorgeous color combination, and so many delightful embellishments to treat the eye! As always, I could gush over this all day! So sweet of Anne to send you that wonderful mold! I know you will get plenty of use out of it! What a gorgeous debut! Fabulous photographs! I always look forward to these, and that fog shot is a special treat! I love fog, too! I love seeing your furry friends from your point of view, but that crow...yuck! I do NOT like crows! We have had many here, but the real creep of the week was having a raven land in our yard--Eeewe! One day when I was out for a run, I saw some crows clicking and clucking among themselves along the road. I said out loud how creepy I thought they were. One got up and and flew over me, grabbing a bit of my hair in it's creepy talons--a scene right out of an Alfred Hitchcock movie! 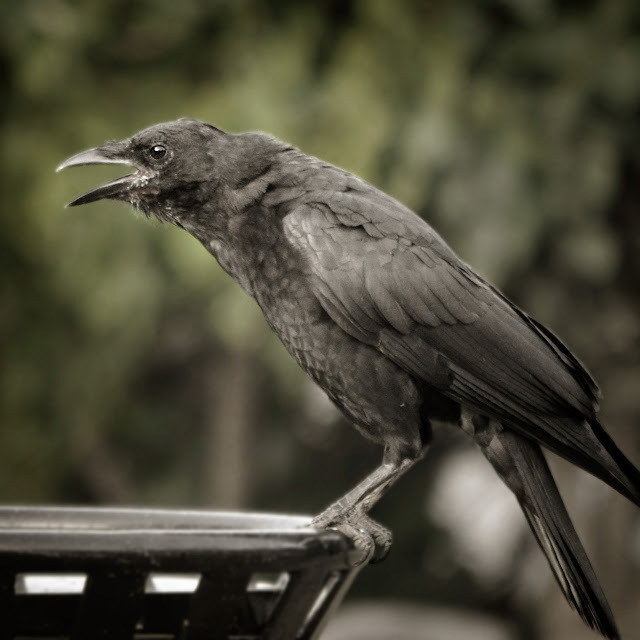 I've never uttered another negative comment about crows again! 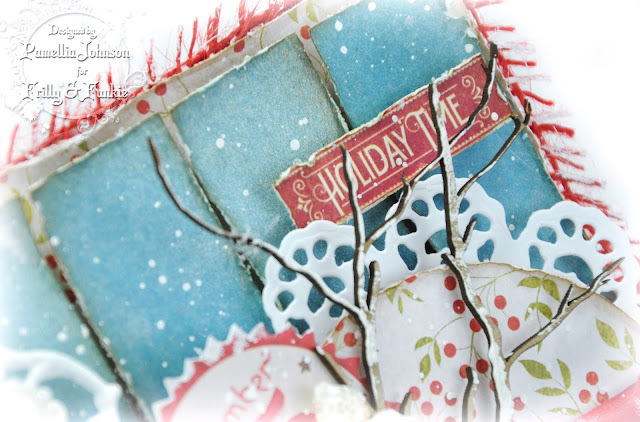 Beautiful Holiday card with so many fabulous textures. That fringe around the edge adds such a beautiful soft detail. Just lovely as always! Gorgeous card, love the design. love all your lovely piccies but sorry to see poor Linda has gone, poor gal. Fancy Bon Jovi being a girl, I wouldn't know how to tell the difference without having a look close up lol! I spy a Christmas card, you are putting me to shame. I love the passage of time theme, with the date, clock, key etc - it would also make a great theme for a New Year card. Great pics as always but I just love the one of Bon Jovi, just look at her fabulous tail. Also, what about that misty lake shot? Amazing, it looks a real winner to me. Yeppers it is about that time to get the Christmas stuff out and done. Such a lovely and festive card design. Isn't that clock mold awesome sauce? It's one of my favorite molds even if the numbers aren't in the correct spot. I sent Prima an email about the numbers burg areas about 6 months ago, still no word back. Oh well. Your key and that little stocking are fantabulous and so fun! Gorgeous card and details! WOW!! Another AMAZING card! You really pack in so many yummy layers and fantastic embellishments. I love the clock piece, key and adorable little boot. Spectacular design...as always, love seeing your creations! 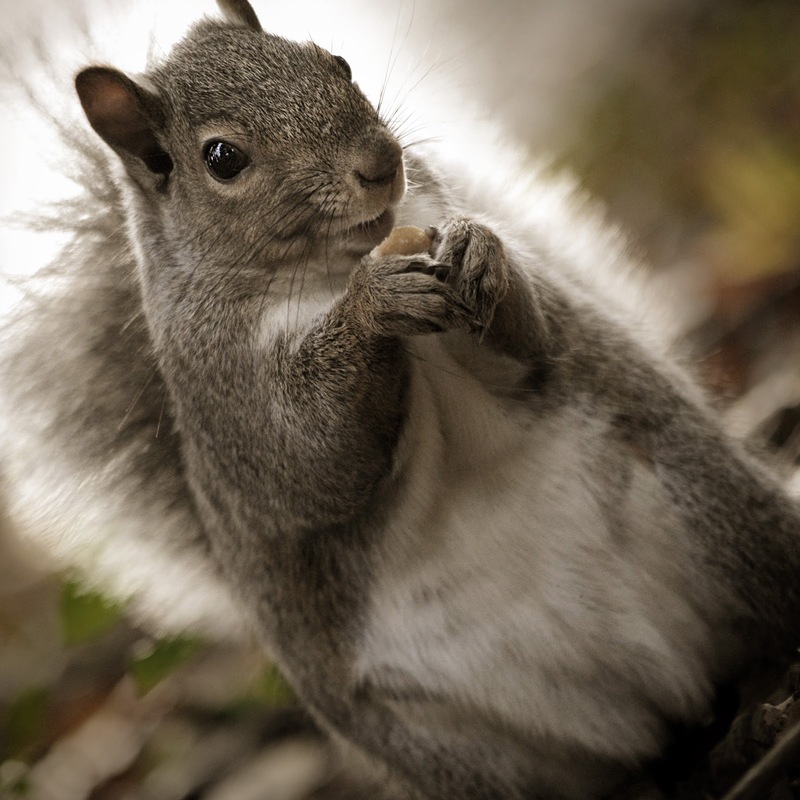 Great pictures of your furry friends. Also, I am so sorry tohear about Linda. I know you loved her to pieces. Sending you a big bloggy hug my friend! Pamellia hun, your forest friends are always a delight! This card really appeals to me - I love the fresh bright colour tones and those blue "planks" add such great dimension and interest to the background. Fabulous! And lovely lovely photos again. Hi, and ho ho ho already! 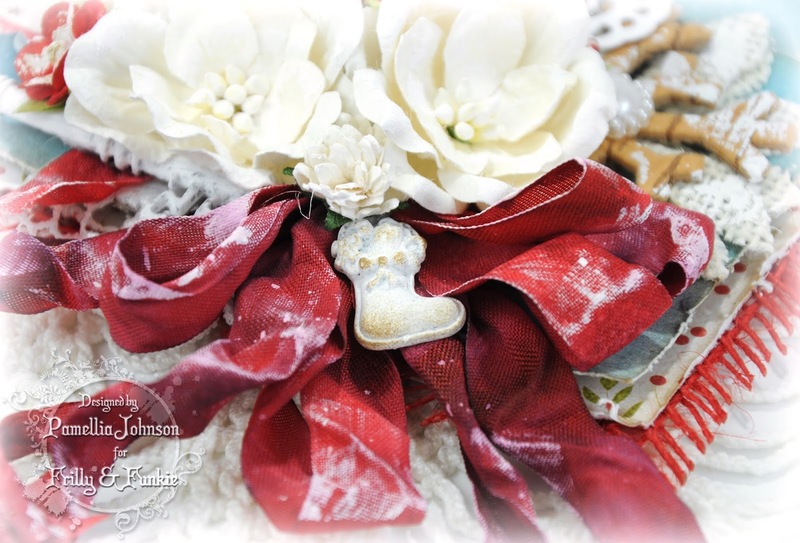 Beautiful shabby and festive work, here! The brighter colors are so well-balanced by the white. (And I cracked up at your Halloween description!) And-and: I always love your images. Really love that mushroom! ANOTHER beautiful masterpiece, Pamellia!! The colors you've used are so fun, festive, and eye catching. There is an incredible sweetness to this card with its many lovely elements and dimension.